In Burundi primary school is mandatory and for free. Despite that many children are not going to school because of extreme poverty of their parents/guardians. For the parents/guardians it is really impossible to give their children a proper education or decently dress them. Instead of going to school the children are doing small domestic tasks or are employed as servant, guard of a herd or as carrier and this for less than a minimal fee. Till today they are convicted to a life in misery. A school education will give them the opportunity to positively evolve. 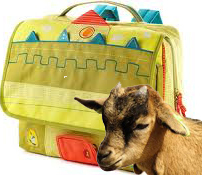 Purchase of a goat per child as provide basic school materials. De goats will be given to the parents so they can take care of their children, also after the first year of the project. The goats will get little ones and produce most for their small garden. On December 1st the board of Vleugels van Hoop vzw met the responsible person of the project, Josephine Bararwendera, in Bujumbura, Burundi. All children have started in school and the purchase of the goats and all schoolmaterials were done. All funds were fully consumed as planned. The invoices were given to Vleugels van Hoop. The student who had 0% didn’t show up for the exam, according to the teacher. The child gave as argument that his mother insisted he would take care of some tasks in the household. The mother though states she never hindered him to go to school. 13 children succeeded, 7 others failed. We count on better results during the 2nd trimester. We again thank the members of ‘Vleugels Van Hoop’ for their support. The parents are very satisfied and other in the same vulnerable situation asked me whether the project will be extended.